Categories › General › Online Event › You Can Chat with Sangfor Technician Online Now! Last edited by Sangfor Elsa 05 Jul 2018 21:03. Sangfor Live Chat is available on Sangfor Community now! Other than make a call to Sangfor call center, send an email to tech.support@sangfor.com, leave a post on Sangfor Community for technical support, now, you can CHAT WITH US online! 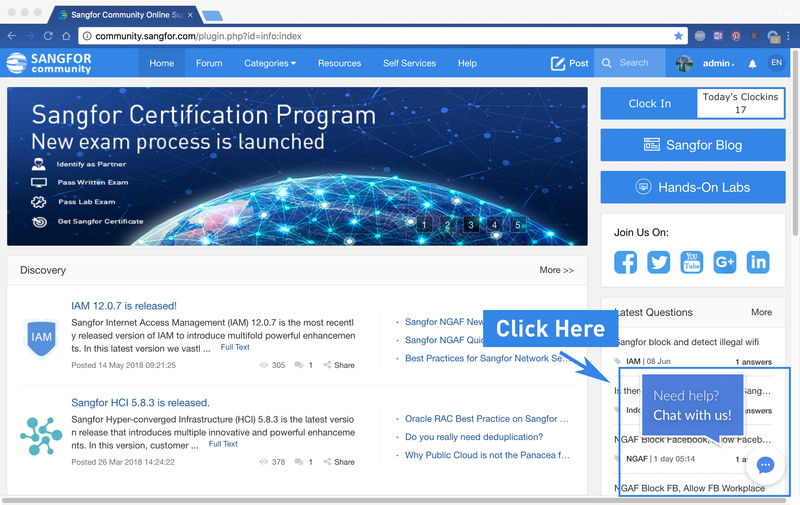 Simply click the chat button which displays on every page on sangfor community, and share us with your name, email, and interests (TechnicalSupport, Sales, Community or others), then you are off to go! Sangfor Technicians will be online 9:00-18:00 Mon.-Fri. GMT+8 to answer your questions. You may also leave us a message beyond working hours, our agents will get back to you as soon as they can. Sangfor Community is dedicated to provide quality technical support to our valued customers. If you have any questions or suggestion regarding Live Chat, Post, Resources or any other aspects of the community, you may contact us by Live Chat, leaving a post and sending email to community@sangfor.com.